Some of my classes are rich with theory. Students take theory classes that focus on the social and political relationships between design and the culture of society. They learn to think about designing for the public sector, specifically as it relates to ill-defined problem solving and the ethical obligations of designers. They read complex articles from computer scientists, psychologists, and sociologists, and they build arguments that synthesize these articles into new ideas. Yet my classes are focused on practitioners, and these students go on to be practicing designers, not academics. They work for big brands, for consultancies, and in startups—and increasingly, they start their own entrepreneurial endeavors. They aren’t pursuing a Ph.D., so why teach theory? Why waste precious class time on academic discourse, rather than practical skills? I’ve thought a lot about what makes a whole designer. One of the qualities is craft and immediacy with material. That’s sort of obvious—someone who makes things needs to be good at making things. But if they only make things and never question the things they make, they are simply a hired set of hands. I’m convinced that theory is also a key ingredient to greatness, a key part of claiming to be a competent, professional designer. There are at least three reasons I think students need to learn theory as part of their foundational design education. Theory gives students the basis for an opinion about their process. A huge amount of design work is subjective. Design research—applied ethnography—gives designers the basis to form a specific opinion in the context of a design problem; it’s deliberate and is often used to substantiate a design decision. But theory gives a designer the basis to have an informed governing philosophy for the process they’ll use to do their work. For example, design research might indicate that homeless people in Texas have different shelter requirements than homeless people in Detroit. It can offer specific details about those contexts and people, and can then be used to substantiate design decisions. Theory about the ethics of designing with at-risk populations can inform the process used to work with those populations. How do you engage with a population that can’t give informed consent? What does it mean to drive a participatory design process, as compared with a top-down process? What steps should a designer take to translate their findings into actionable insights? Theory holds the answers to these process questions, and for a student of design, it presents an evolving body of knowledge that they can lean on as they develop their own methodology for engaging with large-scale problems. Theory gives students the ability to think beyond a single design problem, in order to develop higher-order organizing principles. Each design problem is unique. But after encountering a number of design problems, designers start to realize that there are patterns to both problems and solutions. Identifying these patterns takes time and comes with experience. Theory gives a designer a structure in which to organize their experiences—a way of thinking about the sameness and differentness. It becomes an intellectual taxonomy and a way of organizing different types of design patterns. After years of working as a consultant, I’ve built up a portfolio of work in fields like telecom, consumer goods, entertainment, enterprise software, and so on. That’s not a very useful way to categorize my work, though, because it doesn’t give me a way to draw insight from the work and apply it on future projects. Instead, I try to think about how my work relates to theoretical constructs. Some of my work is related to complex problem solving and explores ill-structured and well-structured problems. Some of my work is related to experience and engagement, and leans heavily on ideas related to affect and learning theory. By reflecting on my work as it relates to larger abstract ideas, I can better think across design problems, and better apply knowledge from one professional experience to another. Theory gives students a sense of purpose, a reason for doing their work. Theory holds a larger meaning for design work, as it grounds it in a cultural context of human want and need. As we reflect on the hours we spend at a job, design theory provides a reason for our hard work, a reason other than “just a paycheck.” We work in design because design changes the world, humanizes technology, and improves the quality of the human experience. Reading and discussing design discourse helps students remember that. We’re seeing an influx of design programs aimed at practitioners, programs that intend to increase the number of designers available to work in the increasingly complex technological landscape. I’m skeptical of programs that don’t include theory, dialogue, and debate in their curriculum. It has been argued that vocational programs should focus on core skills and ignore the larger academic, theoretical subject matter. I would argue the opposite. It is the vocational programs that require this thoughtful context the most, as graduates from these programs will have a direct impact on the products and services that shape our world. To teach theory, I curate a set of readings around various themes. These themes are things like “Power”, “Manipulation”, or “Social Impact”—big, complex and gnarly topics. I try to pick readings that present unique and often conflicting viewpoints, with authors that back up their viewpoints with case studies and examples. The readings are a mix of popular writing (newspaper or blog articles), and academic writing (formal journal articles). In class, we discuss the readings. I provoke debate and conversation using a Socratic style. I ask open-ended questions, juxtaposing one viewpoint against another. I urge students to expand on their thoughts, structure their comments in a meaningful way, and start to develop a unique and synthesized perspective on the readings (instead of simply summarizing what the author said). These verbal prompts, and the subsequent discussion, are analysis prompts. We examine the structure of the paper and the author’s argument. Through this examination, we identify what the author said, and try to interpret what the author meant. This interpretation is the first form of synthesis—of making meaning out of data. But synthesis is difficult in a group setting, where comments and ideas fly fast and loose. Some students process the information by talking through it aloud, while others reflect quietly. It’s my responsibility to be aware of which students are external processors and which are more introspective. A professor friend once told me that the look on the face of a student thinking very hard, and on the face of a student who is bored to tears, is the same. He’s right; I can’t just judge the looks students have on their faces. Instead, I need to form a more intimate connection with my students so I know their particular learning style, and there’s no shortcuts for this—it just takes time and effort. So, a fundamental part of teaching and learning theory is having a personalized, individualized relationship with the professor. Buchanan, Richard. Wicked Problems in Design Thinking Richard Buchanan, formerly the head of the School of Design at Carnegie Mellon (and one of my former professors), writes about the relationship between design and the liberal arts. This article is one of the first to offer a clear relationship between design and large-scale systems problems. Dewey, John. Experience and Education John Dewey is one of the most prolific advocates for pragmatism and humanism in the contexts of art, politics, and education. This reading explores the nature of experience in learning, and paints a relationship between designing learning interactions and designing interactions for mass consumption and experience. Dourish, Paul. What We Talk About When We Talk About ContextAs we dive further into the world of artificial intelligence and machine learning, it becomes increasingly important to have a perspective on the rigidity of design and experiences. Dourish presents a model for thinking about the phenomenological qualities of the experiences we have with technology. Gaver, Bill. Cultural Probes and the Value of UncertaintyBill Gaver presents a unique way to conduct qualitative research called the Cultural Probe. This form of research infuses 'raw' forms of inspiration into the process by including end-users as codesigners. Karnani, Aneel. Fortune at the Bottom of the Pyramid: A MirageThe "Fortune at the Bottom of the Pyramid" is a theory that presents the masses of poor as an untapped market for large corporations. In this article, Karnani makes an argument that this product strategy is a poor one, and explains why. Kurzweil, Ray. The Law of Accelerating ReturnsRay Kurzweil is a futurist that has predicted a "singularity" of technological advancement; this article describes his view of the aggressive speed of innovation and the role it will play on humans in the near future. Le Dantec, Christopher. Designs on Dignity: Perceptions of Technology Among the HomelessLe Dantec is a Professor at Georgia Tech. His work focuses on designing for and with the poor, and his research describes the relationship the poor have with technology. Margolin, Victor. Global Expansion or Global Equilibrium?Victor Margolin, a Professor at University of Illinois, Chicago, has written extensively about the relationship humans have traditionally had with technology. In this article, he describes the potential for global gentrification as our products are exported, along with our value structure. Osberg, Sally. Social Entrepreneurship: The Case for DefinitionAs a relatively new discipline, there's ambiguity around the boundaries of social entrepreneurship and more traditional forms of entrepreneurship. This article explores the similarities and differences in the two areas. Rittel, Horst. Dilemmas in a General Theory of PlanningThis article is one of the often referenced sources for the phrase "Wicked Problems"; Rittel presents attributes that generally define these complex, interconnected social problems. Spears, Dean. Economic Decision-Making in Poverty Depletes Cognitive ControlFor students, this is one of the first articles they've read that utilizes an empirical, experimental approach to understand human behavior. 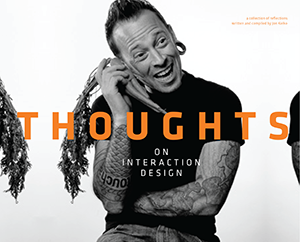 I wrote a book of theory on the topic of interaction design, called Thoughts On Interaction Design, that you might find useful in structuring your own theory classes. You’ll notice that a “lecture” format is missing from my list of in-class teaching methods I use. I try very, very hard to stay away from a pure lecture format. There’s a place for lecture, focused on knowledge dissemination; this is effective when the professor knows facts and content and needs the class to know them too. But this is perhaps the least experiential form of learning, and the least effective. It’s tempting to resort to a lecture because it’s controllable. There are less variables, less things left to the dynamic of the classroom. But that is also why the method is ineffective. A lecture doesn’t give room for change or adaptation. It says to the students, “you are less important than the professor”, which, in a creative field, is simply not true. It’s rare that the professor has the right answer because design solutions are not right or wrong, but only better or worse. The student, their work, and their ideas serve to complete the dialogue. When I do need to communicate information in a top-down autocratic fashion, I keep these session as short as possible, often less than 15 minutes. And, these sessions are framed with interactive and experiential learning to ensure that they have relevance—that they are contextualized in a broader view of the subject matter.